Three buildings. Three anniversaries. Three exhibitions. 2019 is a triple celebration at the Horta Museum. 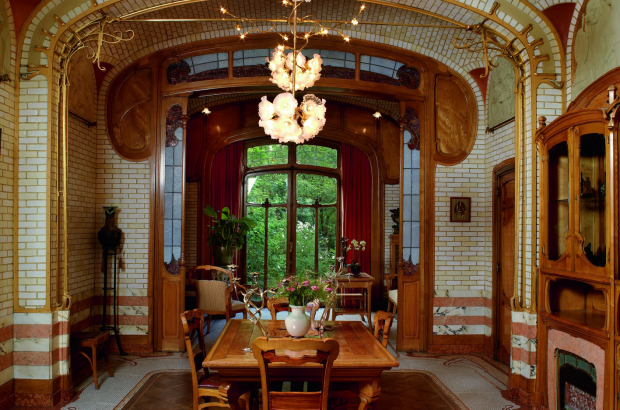 It's 100 years since Victor Horta moved out and sold both his house and his studio, 50 years since the opening of the museum and 30 years since the restoration was started. To mark these annivesaries, Brussels' Horta Museum is putting on three exhibitions, all under the banner of "A Collection of Collectors". The building next door to the museum was purchased a few years ago and has now come into its own. This extension was created to ease the wear and tear on the other two which were suffering from the museum’s international celebrity, by providing a visitor welcome space, an exhibition space and room for the administrative offices. In the extension you have Horta's odd collection of marble samples (on loan from the Museum of Natural History) and in the main exhibition area, 12 current collectors have contributed a few pieces each from their collections. Embroidery artist Elizabeth Horth has arranged those pieces and she has embroidered a portrait of each collector with each embroidery (which took about a month each to realise) bearing representations of the collector and what they collect. The embroideries are displayed with each collector’s pieces. "We have decided to exhibit only people or art movements which happened during the lifetime of Victor Horta (1861-1947)," said museum director Benjamin Zurstrassen. This means that the pieces exhibited for this show include, among other things, impressionist paintings and Art Deco statues as well as Art Nouveau furniture. The exhibition in the main house highlights Victor Horta’s passion for art works of the Far East and, through the study of old photos the veranda has been arranged to be just like it was in 1905. Horta’s collection was broken up and sold at auction but the museum was able to acquire some of those pieces and more are on loan from the Art and History Museum for the show. These latter pieces were originally in major collections of Japanese Art of the late 19th century owned by Horta’s contemporaries. Finally, in Horta’s studio, the third exhibition displays pieces of Art Nouveau furniture from young Brussels collector Jonathan Mangelinckx's remarkable collection of furniture by Paul Hankar, Henry van de Velde, Victor Horta and Gustave Serrurier-Bovy. Most of the pieces on display have never been seen before by the public. Associated activities are a booklet for children to introduce them to the museum and workshops for children on Japanese art including a Japanese bestiary and a half-day colloquium for adults on Japanism in the 19th century.